Dublin protesters are refusing to leave an unoccupied building which the high court has deemed an illegal operation. 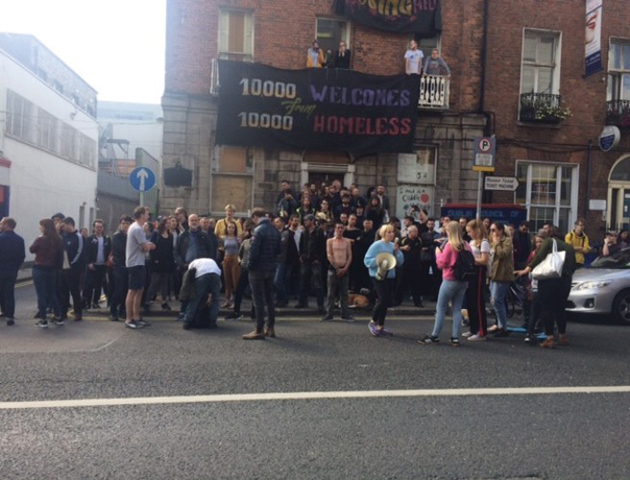 Protesters are refusing to vacate an unoccupied Dublin property which the high court has deemed an illegal operation. 41 Belvedere Place, which is owned by MJH Property Management, has been unused for two years and is one of three uninhabited buildings that protesters occupied in the city. Members of the activist group ‘Take Back The City’ unlawfully entered the building in an attempt to highlight the effects the housing crisis has had in Dublin. They aim to bring attention to the hundreds of deserted properties that exist in Dublin that could potentially be used to stabilise the affordable housing shortage that continues to have impacts on the current housing crisis. The activists have defied the legal notice to vacate the building served to them by Mr Justice Tony O’Conner of the High Court last month. The court heard that the building is not currently safe and does not meet fire safety regulations. It is unknown how long these protesters plan to stay in the building. MJH Property Management also claimed to have plans for the site to be developed into apartments for either sale or letting but no action to complete these has occurred since they occupied the building in 2016. Approximately 590 vacant homes are confirmed to be in Dublin City Council’s possession and nearly 1400 are recorded homeless families. The College View has reached out to the council regarding this matter but is yet to receive a response.